The partnership between the NOAA Office of Ocean Exploration and Research and the Ocean Exploration Trust has been an evolving one, tracing its roots back to 2000. Image courtesy of the Ocean Exploration Trust. Download image (jpg, 69 KB). From June to October 2014, Exploration Vessel Nautilus will embark on a journey to document and research the regions of the Gulf of Mexico and Caribbean. The rotating Corps of Exploration on board the Nautilus will map and explore the geological, biological, archaeological, and chemical aspects of these vast and virtually unexplored areas. And, throughout the expedition, telepresence technology will allow you to follow discoveries and interact with scientists live via the nautiluslive.org website , putting the unexplored ocean directly into your hands. Follow the LIVE seafloor video and send in your questions to our scientists on board on nautiluslive.org . Hercules and Argus on deck getting ready to start exploring for their second dive of the season! Image courtesy of the Ocean Exploration Trust. Download image (jpg, 30 KB). 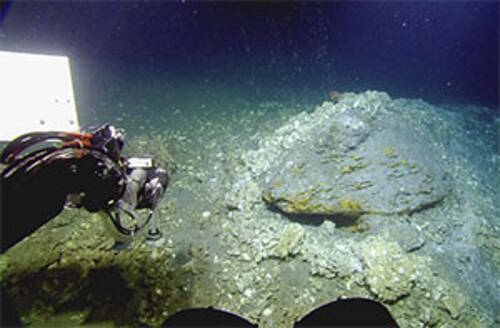 During this leg, the Corps of Exploration focused on the discovery of new cold-water ecosystems and improved understanding of underwater geological hazards and processes along the Straits of Florida, located between Cuba and the Great Bahamas Bank. In addition to a diversity of life , scientists saw a range of exciting geologic features, such as landslide deposits and methane seeps. View photos from this mission. 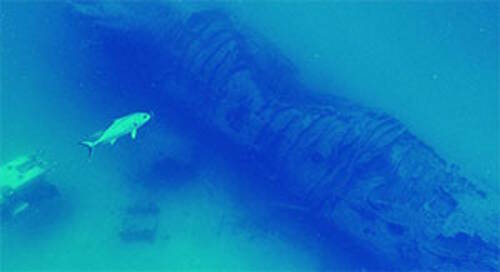 Hercules gets a full view of U-2513, a German U-boat captured in Europe after World War II. Image courtesy of the Ocean Exploration Trust. Download image (jpg, 11 KB). E/V Nautilus explored off the coast of southern Florida, to gain a better understanding of the ecological connectivity of deep-water biological habitats and communities to the Florida Keys National Marine Sanctuary, the Tortugas Ecological Reserve, and Pulley Ridge Habitat. Information gained during this cruise will aid the ongoing sanctuary management plan review by documenting the physical and biological connections of these unique places. 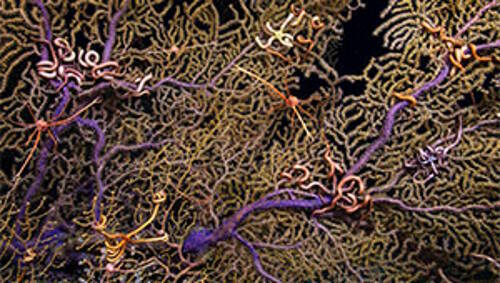 Brittle stars on Paramuricea coral at site visited during mission. Image courtesy of the Ocean Exploration Trust. Download image (jpg, 47 KB). This cruise is part of a larger research program focused on examining the ecosystem-level response to oil and gas in the Gulf of Mexico. The research group leading the cruise, the Ecosystem Impacts of Oil and Gas Inputs into the Gulf of Mexico Consortium, will be studying deep-sea corals, animals that live on and around corals, and their responses to both natural oil and gas seepage and the 2010 Deepwater Horizon oil spill. View a summary from this mission. Mussels seen during exploration of brine pools in the Gulf of Mexico. 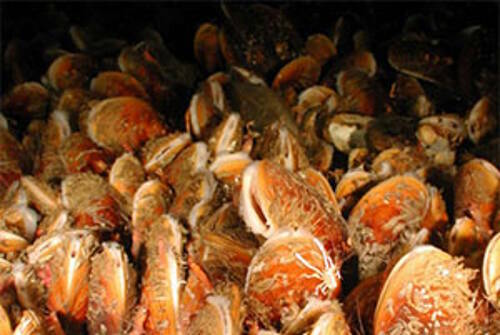 Symbiotic bacteria living in the gills of the mussels use the methane to feed the host mussel. Image courtesy of the Ocean Exploration Trust. Download image (jpg, 34 KB). During this expedition in the central Gulf of Mexico, researchers will be documenting brine pools and lakes, deep-water coral ecosystems, and several shipwreck sites. In addition to known shipwreck sites, the Nautilus team is working with the Bureau of Ocean Energy Management to select unidentified sonar targets to investigate during this expedition. View photos and summaries from this mission, including from the exploration and identification of a previously unknown shipwreck , an overview of brine pools explored, and the biology of shipwrecks . Natural petroleum seeps (bubble plumes) rise out of the seafloor and disperse in the water. Image courtesy of the Ocean Exploration Trust. Download image (jpg, 40 KB). Scientists with the Gulf Integrated Spill Response Consortium will acoustically and visually map gas bubble/droplet plumes through water column in the central Gulf several different times per day. Information gained from these studies will help in developing a multi-scale modeling system to help predict how oil behaves in the ocean, ultimately aiding in effective oil spill response. Read more about the experiments and instruments from this mission. Samples collected during ROV dives are processed quickly so that biological samples can be preserved in such a way that they will be useful to scientists in the future. Image courtesy of the Ocean Exploration Trust. Download image (jpg, 21 KB). Nautilus will explore the deep waters areas around and offshore the cayes and atolls of the Belize Barrier Reef, including potential mud volcanoes off Turneffe and Lighthouse atolls. These waters are some of the least-studied areas of the Caribbean Sea, having never been explored or mapped. Information from this cruise will help in understanding the dynamics of the Gulf of Honduras and the health of reefs in the area. View more images of sample processing and read about high-resolution maps of the reef that were created during the mission. 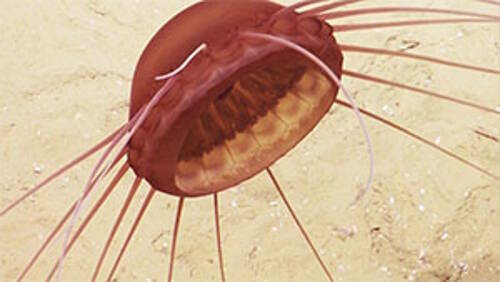 The first dive at the Windward Passage was full of interesting biology, including this jelly. Image courtesy of the Ocean Exploration Trust. Download image (jpg, 21 KB). 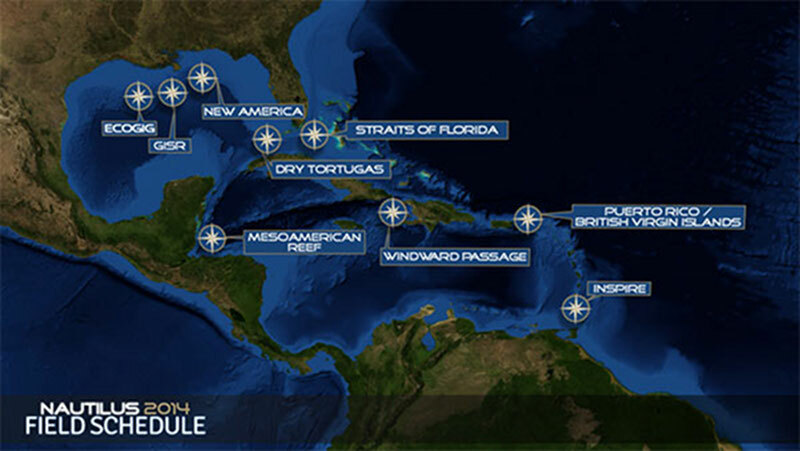 During this expedition, Nautilus will explore the Windward Passage, located between Cuba and Haiti. The tectonic volatility of this largely unexplored area has led to catastrophic events such as the 2010 earthquake in Haiti, making the collection of additional information on the seafloor critical to understanding potential future impacts to human life and property as well as marine resources. 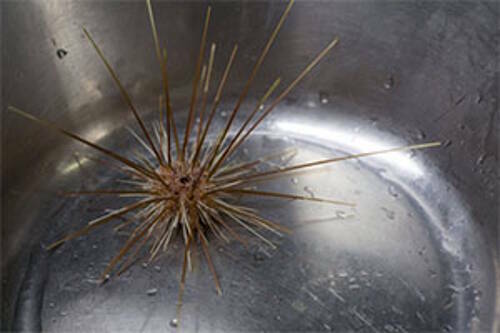 View images of other strange critters encountered while exploring Windward Passage, as well as images depicting the day-to-day operations on the vessel during the expedition. Zoanthids, a type of cnidarians, seen on Conrad Seamount. Image courtesy of the Ocean Exploration Trust. Download image (jpg, 29 KB). Located in the Caribbean region, the unexplored seamounts of the British Virgin Islands will be the setting for this cruise. Scientists will explore seamount environments in the Greater Antilles/Lesser Antilles transition zone to gain insight into the geological origin, the spatial distribution, ecology, and biodiversity of marine life associated with the seamounts. 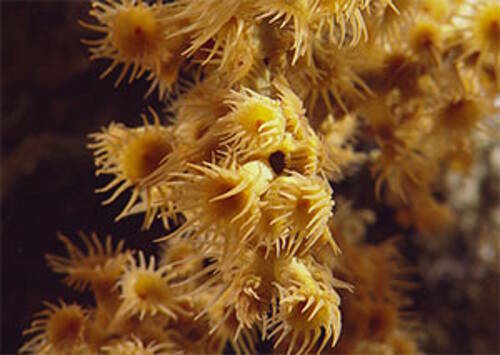 View images from Conrad Seamount , Dog Seamount , and other areas explored during the mission. 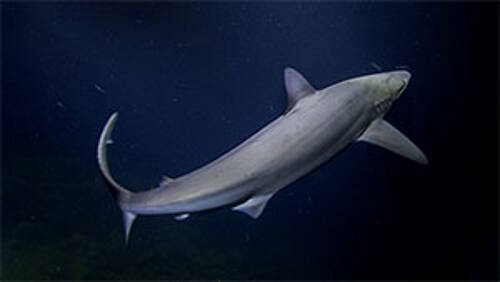 A Caribbean reef shark encountered while exploring the Kick'em Jenny volcano. Image courtesy of the Ocean Exploration Trust. Download image (jpg, 9 KB). Nautilus will round out the 2014 field season with a return trip to Kick’em Jenny volcano, the most active submarine volcano in the Caribbean Sea. This year, scientists will deploy a new set of sensors to examine any changes in gas/fluid venting in the inner crater that might indicate renewed eruptive activity. They will also explore a large province of cold seeps and mud volcanoes North of Trinidad & Tobago. View images of creatures from Kick'em Jenny as well as photos of sampling being done at the volcano. The partnership between NOAA’s Office of Ocean Exploration and Research and the Ocean Exploration Trust has been an evolving one, tracing its roots back to 2000. 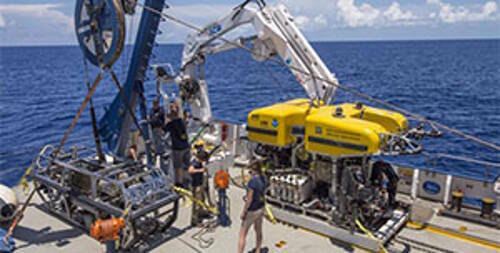 NOAA Ship Okeanos Explorer was developed alongside E/V Nautilus , allowing the sharing of telepresence technology to bring the wonder of ocean exploration from ship to shore. In addition to providing funding support for the Nautilus mission, the Office of Ocean Exploration and Research continues to work with the Ocean Exploration Trust to advance technology and reduce uncertainties in critical parts of our largely unexplored deep ocean.